2013: This church is awaiting a new entry. In 2008 I began: Once, Belton was in Suffolk. But in 1974 they moved the border; and so, as we headed north from the lovely Lothingland lanes into what is now the somewhat dismal outer suburbia of Great Yarmouth and Gorleston, we were in Norfolk once again. 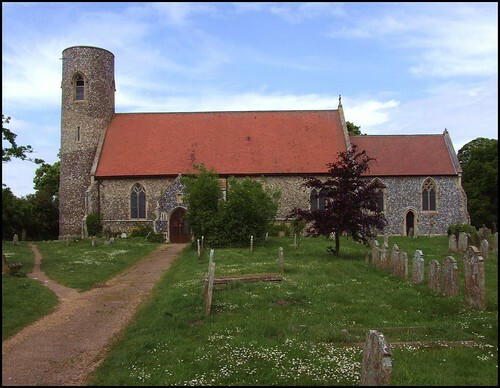 At the end of the Second World War, Belton was a remote village of not many more than the 600-odd people who'd lived here at the time of the 1851 census, when the population peaked in many rural East Anglian parishes. In the 1940s, Arthur Mee came this way for The King's England: Suffolk, and remembered Belton's churchyard for a beautiful view of the village and its winding street among the trees below. In the 1960s, East Suffolk county council made plans for a massive expansion of villages in this area. Today, the population of the parish is not much less than 5,000. Belton has the worst of both worlds: it is a bit of suburbia which has floated off, and drifts in isolation from the urban conveniences, but is without any of the charms or attractions of much of rural Norfolk. My heart sunk as we threaded our way through the estate of look-alike houses to find a lane that hardly seemed to be there, as if it had been forgotten, or left behind. This led out on to the edge of the village, and there at a sharp bend in the road was the church of All Saints. 2013: I plan to pay a surprise return visit to Belton when the weather gets better.